It seems that even the Western European Monsoon couldn’t put off 32 of our hardiest volunteers who arrived at to our June cleanup near Garfield Road Recreation Ground! 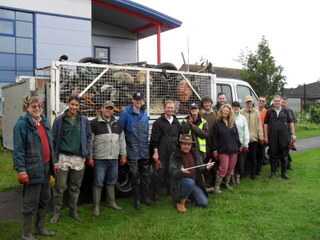 …right until the end of the cleanup, when the bridal party posed for a rather more unusual group photograph! 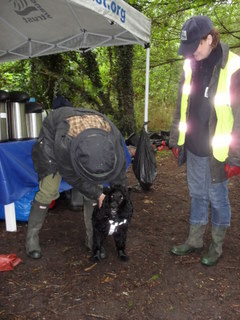 Stopping half way through for very welcome hot coffee, tea, cheese scones and marshmallow raspberry squares made by Sally and Jo, we were joined temporarily by Nelson the cocker spaniel, who, like his namesake over two hundred years ago, was enjoying a walk by the Wandle! 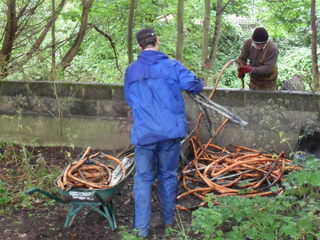 After refreshments, we went down towards the railway bridge and worked upstream. 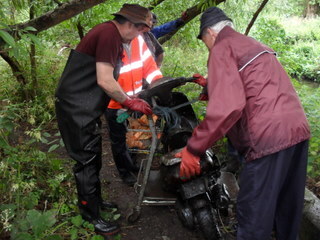 One of the first finds on this site was a motor scooter, which we managed to get onto a small flatbed trolley and get to the dump site by negotiating a muddy slope and a couple of fallen willow branches which had to be lifted up to allow the trolley to pass underneath. 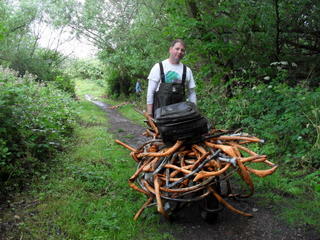 Towards the end of the afternoon, someone also found an illegal eel net or crayfish trap. Eel nets have to be licensed by the Environment Agency in a similar way that anglers need to licence their fishing rods and, if legal, should have a numbered tag on it to allow identification. This one had trapped lots of other small bits of rubbish, as well as an eel which we managed to set free and return to the river. At precisely 2.30pm, Stan from Merton Council came and everyone helped load up his truck. And then there was just time for a team photo before everyone squelched their way home! 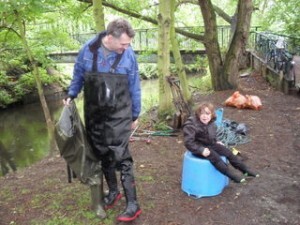 … and rescued and returned 1 eel to the river! 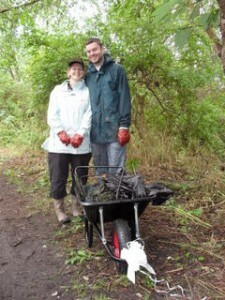 This entry was posted in Uncategorized and tagged Cleanups, Events, Wandle on June 28, 2011 by Erica. Good work everyone, well done! 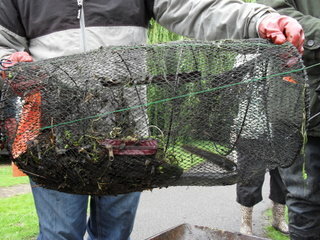 It’s particularly gratifying to see that the clean ups not only improve the river environment but things such as this illegal eel trap can be removed at the same time. 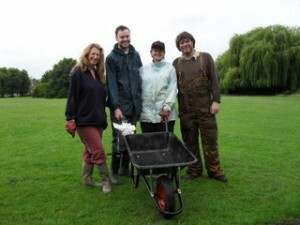 With the Wandle being an eel stronghold this becomes all the more important.